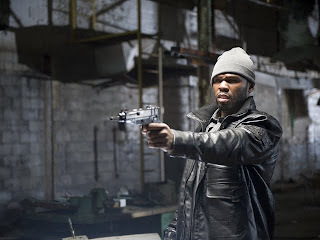 As an infrequent, casual fan of the genre who is completed unschooled in the world of rap, I may not be able to tell you the first thing about the musical career of Curtis “50 Cent” Jackson. However, Jackson’s work in film is a decidedly different story as over the past few weeks I had the opportunity to see the man in question perform in not one but two films when Joel Schumacher’s Sundance selection Twelve landed in my inbox right around the same time that director Jessy Terrero’s urban action drama Gun arrived as well. 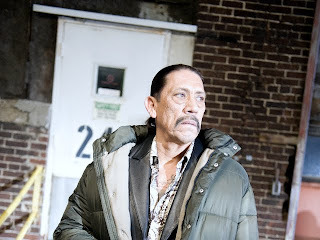 Having flown under the radar during the 2010 calendar year, both films were given an extremely limited theatrical run after debuting at festivals, with Gun opening in only one city following its screening at a Latino themed fest in New York. Yet while conventional wisdom would have us believe that the professional polish of Phantom of the Opera director Schumacher, the promise of Sundance approval and the pretty A-list cast of up-and-coming stars ensured that Twelve would be the superior offering particularly because it’s based on a literary bestseller, surprisingly Gun is the title that held my attention the most during its succinct eighty-two minute running time. 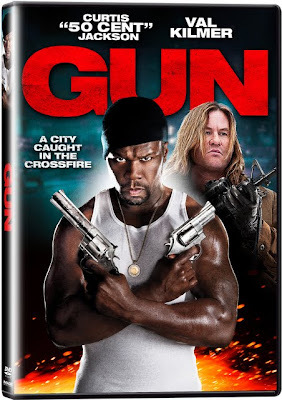 Reuniting actor Val Kilmer with his Streets of Blood costar Jackson for a film that additionally credits the rapper/actor as Gun ’s screenwriter, Terrero’s workmanlike B-movie is a solidly crafted crime drama. Steering clear of a need to reinvent the wheel or over-complicate things to pretentious levels a la Brooklyn’s Finest , Terrero understands that the ultimate goal of Gun is to flat-out entertain its audience with its story of a recently released con Angel (Kilmer) who reunites with Jackson’s gun-runner on-the-rise, Rich. And although we don’t completely buy the leads’ camaraderie or trust how quickly Rich brings Angel into his operation, recklessness seems to be in Rich’s nature as he’s bold enough to supply Detroit with weapons courtesy of Uncle Sam via his beautiful connection (Annalynne McCord), knowing full well that the police are trying to build a case against him despite their dwindling law enforcement budgets. Similarly, the ambitious Terrero overcomes a low budget and takes a deceptively simple and ultimately familiar storyline with a third-act twist that we start to suspect long before it’s ultimately revealed and uses it like ammunition to ensure that everything impressively clicks into place. His command of the project is quickly evident as Gun exceeds expectations from the start during an impressive opening sequence that keeps diverting your attention until you’re unsure just when and where the impending violence will land as various characters strategically create a chess like ambush to take out their gun-running competition. And repeatedly, it’s these unexpected touches and new twists on an old crime movie concept such as offering McCord a role that transcends mere girlfriend by making her a military arms supplier and infusing the secondary police plot with some topical concerns regarding inter-agency tension, budgetary constraints, red tape and corruption that makes us forgive some of the contrivances in Gun’s dominant plotline. Aside from a perfunctory blink-and-you’ve-missed-it conclusion, Terrero and Jackson’s effort is slickly executed and briskly paced enough to prevent this Gun from jamming completely when the truth about a character’s motivations come to light and ultimately lessen rather than increase the emotional tension of the slightly weak final act. A satisfying B-movie that reminds you of an updated vintage B-Film Noir where two old associates reunite despite years of varied experiences that have left them worlds apart in terms of priorities and plans, Gun may not be the stuff of standard Schumacher or Sundance but when compared to Twelve , it comes much closer to hitting the target by keeping the audience’s enjoyment in close range.